About Phoenix Lodge No. 8 A.F. & A.M. It is known that prior to 1787, there existed a Lodge of Freemasons in the upper Cape Fear River region operating under the name of Union Lodge. Its existence – though not its origin - is documented by Masonic historians. The authority under which this Lodge operated is not known, nor was it known to have been numbered. This Lodge was believed to have met at Colonel DeKeyser’s home on Cool Spring Street and other locations. The records of the Grand Lodge of North Carolina show that Union Lodge (also known as Cape-Fear Union Lodge), was one of nine Lodges in North Carolina that called for the establishment of a regular Grand Lodge in North Carolina. This Grand body was duly constituted on 9 December 1787. Shortly thereafter, Union Lodge petitioned this new Grand Lodge for a charter, requesting that the name Union be expunged and replaced with Phoenix. Union Lodge turned in its original charter, warrant, or dispensation, and was accepted into the Grand Lodge of North Carolina on 17 November 1788 – the official founding date of Phoenix Lodge. On 25 June 1791, the Lodge received its formal charter as Phoenix Lodge No. 8. In 1793, the lot upon which our present lodge building is located was deeded in perpetual trust by local Realtor, philanthropist, and ardent Freemason James Hogg. The cornerstone for the original Phoenix Lodge building was laid on June 25, 1793 in a lavish ceremony at Mason and Arch Streets on the spot known as Saint John’s Square. When Fayetteville held the first celebration of George Washington's birthday in 1797, the local citizens ended their parade with a celebration at Phoenix Lodge. At end of the Revolutionary War in 1783, the villages of Campbellton and Cross Creek merged and the resulting town was named Fayetteville in honor of Revolutionary War General the Marquis de Lafayette. He later visited Fayetteville on 4-5 March 1825 to express his appreciation of the gesture, and presided over a meeting of Phoenix Lodge on 5 March 1825. By 1849, the lodge building had fallen into such disrepair that it was torn down and rebuilt from 1855-58, using the original 1793 foundation. The mid-portion of the present building is the rebuilt structure, and incorporated some of the timber from the 1793 building. Major renovations, to include expanding the building, were completed in 1949-50, and ongoing restoration and renovation efforts have continued since that time. Descended from Union Lodge No. __ , an old lodge of uncertain origin in the Cape Fear region which turned in its charter in exchange for a dispensation from the Grand Lodge of North Carolina. Established as "Phoenix Lodge" on 17 November 1788 Under a Dispensation from the Grand Lodge of Ancient York Masons of North Carolina. Received the Number "8" on 25 June 1791. Chartered by the Grand Lodge of North Carolina in 1793. Re-Chartered by the Grand Lodge of North Carolina Free and Accepted Masons in December, 1796. Chartered as a Corporation by the North Carolina State General Assembly in 1799. Re-Chartered by the Grand Lodge of North Carolina Free and Accepted Masons, 15 October 1801. Phoenix Lodge No. 8 is one of seven A.F. & A.M. Lodges in the 17th Masonic District of The Grand Lodge of Ancient Free & Accepted Masons in North Carolina. 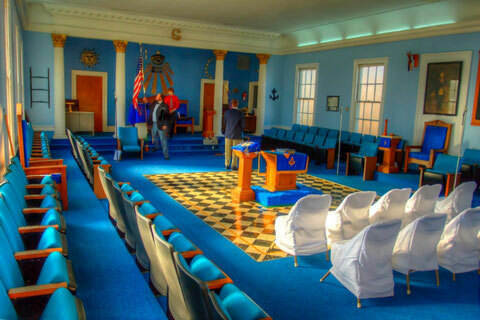 Our membership hovers around 300 members, making us one of the largest and most active Masonic lodges in North Carolina. Our Stated Communications (business meetings) are on the second Tuesday of each month, year-round. We always have dinner at 6:30 pm and open the Lodge at 7:30 pm. Visitors and guests are always welcome for dinner, as are Entered Apprentices and Fellowcraft. We regularly hold degree work on the third and fourth Tuesdays, and are normally dark on first Tuesdays. We hold a Fellowship Breakfast on the first Saturday of each month, rain or shine. We normally have coffee on at 8 am, and serve breakfast from 9 to 11 am. Friends, families, children, guests, and visiting Brethren are always welcome! If you are interested in petitioning the Lodge or would just like a tour of our historic building, this is a great time to visit. Please take a look at our Facebook page at "Phoenix Lodge No. 8, AF&AM of North Carolina" for frequent updates and information about upcoming events.